Now hear this... The talented and deservingly illustrious Clark brothers of graphic design & illustration studio Invisible Creature will be coming to San Diego on April 2nd to give a talk and share some insight into their design process on stage at the infamous Casbah! 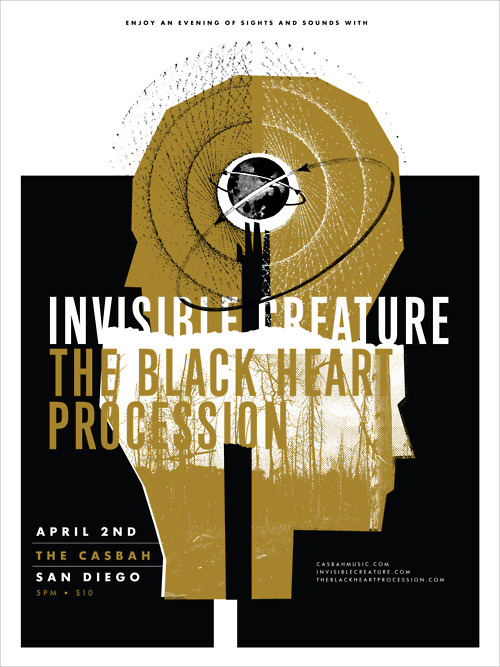 One of their favorite bands, SD-based The Black Heart Procession will play a set afterward, rounding out an interdisciplinary evening of design and music. You can thank the recently launched Neat Neat Neat for bringing us such a world-class happening. The Invisible Creature event is just the first of many big things to come from Neat Neat Neat, so keep yer eye peeled and your monocle handy. Finally, we're proud to say that Minstrel Fridays is BACK, baby! What better time to resurrect the mixtape series we started way back when (2008! ), then with a hearty sampling of Invisible Creature's musical influences through their "Top 10 At-The-Moment" tunes? The answer is: no better time. This week we're featuring Ryan Clark's Top 10 songs ... stay tuned next week for another top 10 from his brother Don Clark.